I have been very step motherly with my randomness of thoughts here!! Not because I haven’t much to say (that my friends will never happen!!). Its just that I haven’t enough time. The classes are going well. The writing’s going great and so is life in general. Yet the step motherly treatment!! Well am about to remedy it now with this post. The dash to Bangalore last week still lingers on in my head. The relief of seeing amma after what seemed like eternity but was only 2 months, Rachel having really grown and getting to display some of my stuff for amma to praise as only she can!! Rachel’s quite the little energetic 7 month old. She’s got everyone including Cindy the dog wrapped around her little fingers. Infact poor Cindy gets to feel her vice like grip around her floppy ears more than we’d like to imagine. She grins and whines and hopes that we notice she isn’t growling!! Rachel also has quite the sweet jaw. With no teeth, I guess that’s what you should call it……I found out when I tried feeding her some yet unfrozen roasted banana ice-cream I made. She wanted the bowl in her hand to make sure I was going to feed her all of it; you should have seen that mouth opening for the spoon!! If that wasn’t the most desperate baby I have seen, then what is?? Feeding her non sweet stuff needs the patience of an angel! She’s also at the stage where everything gets to meet her mouth first. So she gurgled with joy at the cat shaped cushion I made for her (of which I haven’t any pictures). She was good behavior personified all through her dedication tho. All dolled up in a little gown and matching shoes, she looked nothing like the mischievous little toddler she is. 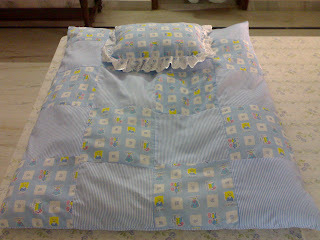 Am posting pics of the baby beds with pillows that I made for her. The pink one took me more time and patience than I had imagined. All my fault because my technique (which like murphy’s law I realized after I messed up) was wrong. It’s a nightmare to stitch cloth on four sides. The blue one is the one I made after wizening up. Attached vertical and alternate panels, then cut again to stitch them into a patchwork. 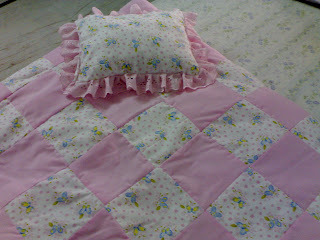 I was dilly dallying over doing something handmade, then thought, more than Rachel it will be my gift to amma. She hasn’t been able to make her dream patchwork quilt because of her failed eyesight. And this was my humble offering to her. She was so happy, so is the little one, imagine sucking on all that lace!! It turned out better than I imagined. K says I can think of selling the stuff now!! The gift of the hand mixer has been inaugurated yesterday. I made chocolate chip cookies. The rechargeable batteries of the camera refused to work and I haven’t any pictures of them for Escapades. I’ll just have to make another batch!! 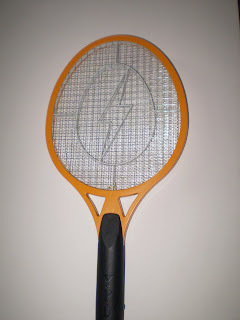 While I type up this post, K is going around the house zapping mosquitoes with the new mosquito zapper. It looks like a badminton racquet but works like a barbeque of sorts. When on, whatever flies into it gets charred!! With the rains cometh the mosquitoes and this for the last few days since we bought it at a traffic signal, is K’s favourite sport!! I think this is the closest he will come to hunting!! haha i have seen these zappers being sold at traffic signals and also used them at a friend's place..